Let Me Show You the Light- Well Headlight.. I am going to help you see the light…so to speak. Our automobile headlight choices have gotten much brighter over the years. The fact is we generally can’t accurately tell how well or how poorly the road is lite in front of us. We all have subjective impressions, reactions, and miss guided feelings about how “good” or “bad” our headlamps are, and you might feel strongly about your opinion. Those opinions differ with the actual objective, measurable, and real lighting performance. The introduction of LED lighting has been noticeable on the roads, and even in the commercial aircraft business in which I work this has clouded the water even more. These new headlight choices have allowed people to make the roads more dangerous instead of safer. In hopes that the roads I travel so often can see brighter days, I present my guide to headlight selection! There are many factors which come into play when it comes to visible light seen at night so let’s start with some basics: Watts (W). A watt is a measurement of power: How hard your power source needs to work to produce light. The higher the wattage listed, the more energy required. The type of light used is important; not all light is produced equally. 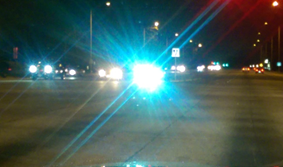 All lights produce lumens (lm), which is the main ingredient for sight while driving at night. Older general use lights known as incandescent lamps, produce 10-15 lumens per watt. In contrast, sodium vapor lights kick out a whopping 85-125 lumens per watt. The problem is that we can’t have a large sodium vapor light duct-taped to our bumper. In recent years LED technology has exploded. Some LED now produces up to 150 lumens per watt. This dramatically surpasses HID, the old cat’s meow. These LED are very pricey (upwards of 250-300/pair), but offer longevity. The most prominent issue with them is that they lack proper light patterns from OEM projectors( headlight assemblies). On the near left OEM 3500k On the right a 6000K. Which would you rather drive past? One misconception most people make when shopping at their local auto stores is that a lot of K’s are good. NO! That is not correct! Kelvin(K) value is a marker of color temperature. Lower K (1800) is a warmer red, and higher K (10,000) is a colder color blue. Some more head spin is coming up…the human eye absorbs the most visible light (lumens) at night in the range of 4500K-5500K. Think about that when you look at the figures above. Using a value above 4700K will produce a safety hazard to oncoming drivers. Your bright light will blind them. In some states, this high of a Kelvin value is frowned upon, but ultimately it is the vehicle owner’s responsibility to create a safe environment for oncoming drivers. So don’t be one of those “I got 10,000 K lights dude, and they are awesome” drivers. Fog lamps are meant to be used in dense fog, rain, or snow to help the driver see the edges of the road close to the car so she/he can safely make progress through foul weather at very low speeds. That is all these lamps are designed, intended, and able to do, and most of the ones available as a factory or optional equipment or in the aftermarket aren’t even capable of doing that. So, what is a right fog lamp? A good fog lamp produces a wide, bar-shaped beam of light with a sharp horizontal cutoff (dark above, bright below) at the top of the beam, and minimal upward light above the cutoff. Proper (and legal) fog lamps may produce white or selective yellow light. Selective yellow light can improve a driver’s ability to see in fog or rain or snow, but not because it ‘penetrates fog better’ or ‘reflects less off droplets.’ In fact, it’s because of the way the human eye processes different colors of light. Blue, indigo, and violet are difficult for the human optical system to handle correctly. It is the beam pattern, not the light color, that defines a fog lamp—and most of them use tungsten-halogen bulbs though there are some legitimate (and a lot of illegitimate) LED fog lights beginning to appear. Xenon or HID bulbs are inherently unsuitable for use in fog lamps, and blue or other-colored lights are also the wrong choices. I hope reading this will remind you to be considerate of other drivers in your light choices because we don’t want to meet on comers on the road other than in a rest area while you drive around this country! 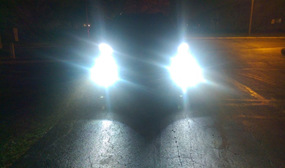 This entry was posted in Our Gear and tagged Fog Light, HID, K, LED, Lumens, Watt. Bookmark the permalink.